Get the job done right with advice from an experienced gardener. For most deciduous trees and shrubs, winter is the best time for pruning. Plants are dormant and bare, so it’s easier to see the branching structure and get a sense of what needs to be removed. It’s also better for the plant because winter pruning promotes quick regrowth in spring and limits the exposure of the wound to insects and disease. The first rule of pruning is this: Don’t prune unless you have a good reason. One reason could be the appearance. You might have a young plant like a fruit tree, and want to train it into an open canopy and balanced shape. Or maybe you want to control the size of a shrub to ensure it doesn’t outgrow its space. 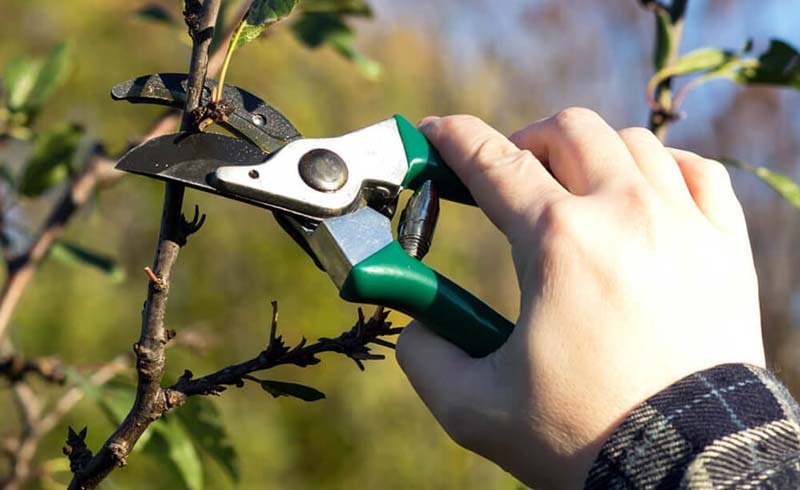 A major reason for pruning is to encourage flowering or increase fruit production, especially in plants like forsythia and highbush blueberry. Finally, dead, broken or hanging branches are a safety hazard, so it’s best to get them out of the way. Pruning can be an intimidating task for a lot of gardeners, but pruning mistakes are similar to a bad haircut: It may look funny for a while, but it’ll grow back. Here are some tips to help you tackle winter pruning. DO pick a dry, sunny day, which is more comfortable for you and beneficial for the plant. Wet plants can spread disease. DO start with clean, sharp tools. If you remove diseased tissue, wipe your pruning tools with a 10 percent bleach solution between cuts. DO study the shape of the plant and consider each cut before you prune. DO start by removing the three D’s— dead, damaged or diseased wood. DO take out any crossing branches. Rubbing injures plant tissue and invites disease. Typically, the smaller of the two branches is removed. DO remove water sprouts and suckers. Suckers grow from the base of the trunk or the roots of trees, while water sprouts emerge from branches. Both are vigorous, fast-growing shoots, but interfere with healthy growth, flowering and fruiting. Water sprouts on fruit trees also block air and sunlight, reducing fruiting and increasing the risk of wounds and disease. DO trim long, unbranched stems back to a healthy, outward-facing bud. This is called heading and will stimulate nearby side buds and branches to grow. 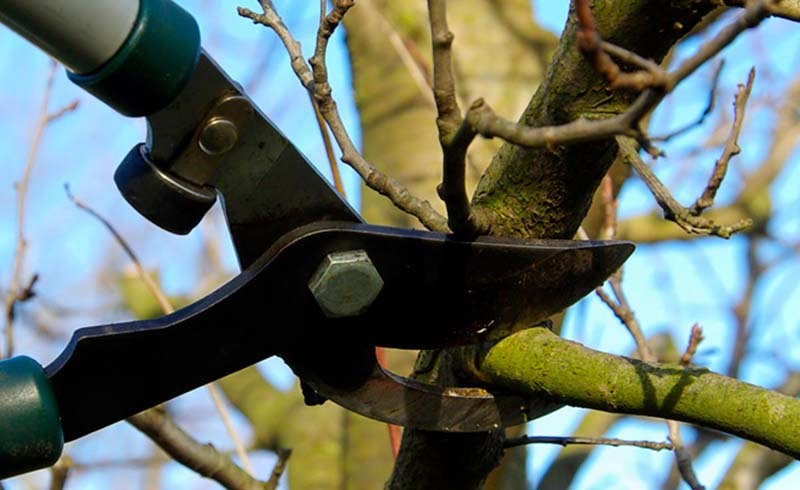 DO prune overgrown or bushy trees and shrubs by making thinning cuts, the most common type of cut. This will allow more light and air to reach the center of the plant. To thin, prune the branch or stem back to its point of origin at the base of the plant, a main stem or the trunk. DO take frequent breaks to step back and study the plant to make sure your pruning looks balanced and natural. DON’T leave unsightly stubs, which can become diseased or infested with insects. Instead, prune to a healthy out-facing bud or branch. DON’T shear shrubs into unnatural shapes unless you wish to create a formal hedge or topiary. Trees and shrubs look best when allowed to grow to their natural shape and size. DON’T overprune. A rule of thumb is to remove no more than a fourth to a third of the canopy per year. DON’T be shy about pruning mature neglected shrubs. Multistemmed shrubs like lilacs, forsythias and dogwoods can be rejuvenated with the gradual removal of old wood. Begin by pruning a fourth to a third of the old stems. Repeat each year until all the old wood is removed. DON’T cut tree limbs flush to the trunk. Instead, cut the branch where it meets the branch collar. This will promote quick and healthy callusing of the wound and there is no need for pruning paint. DON’T forget safety! Wear eye protection. Never prune plants close to power lines or try to remove branches that can’t be reached with a pole pruner. Instead, call the experts! What to prune in winter? Summer-flowering shrubs and trees such as rose of Sharon, crape myrtle, potentilla, smoke bush, butterfly bush and beautyberry. They produce flower buds on new growth and respond well to dormant pruning in winter. Shrubs grown for foliage, such as barberry, privet and burning bush, are also good candidates for winter pruning. Deciduous fruit trees such as apples, pears, cherries and plums. Dormant pruning removes some of the flower buds, but it also opens up the tree to more light and air, boosting tree health and fruit size and quality. Fruiting shrubs such as highbush blueberries, currants and gooseberries. Remove the oldest stems at ground level to encourage fresh fruiting branches. Deciduous trees like oak, honey locust and linden. As with smaller shrubs and trees, it’s easier to see the framework of the branches in the winter. What not to prune in winter? Spring-flowering shrubs and trees like forsythia, lilac, quince, bigleaf hydrangea, rhododendron and azalea, which form their flower buds on wood from the previous year. These are best pruned after flowering in spring. Trees with heavy winter sap flow like maples, dogwoods and birches. Sap loss won’t hurt the trees, but it can make a sticky mess on nearby structures, cars or furniture. These trees are easier to prune in midsummer when sap flow isn’t a problem. Most conifers should be pruned during their growth spurt in late spring. Do research on specific conifers for tips.